Getting organized is one of those things that seems to constantly remain on my list of things to do. It’s a tasks that feels like it is never even close to being accomplished. That’s why I was excited when Tsh announced Project Simplify, because I figured I could probably follow along with decluttering and organizing her hot spots for five weeks, and if I blogged about it, I would have even more motivation and accountability to finish the projects. Since we’re covering green spring cleaning here at Live Renewed this month, and I am really not one to give advice or write posts on organizing, I thought it would be fun to share the organizing and cleaning out that I’m doing as part of this project. You can read the ‘how-to’ over at Simple Mom, and then I’ll show you how I applied it to my home. It would also be great if you wanted to join in with Project Simplify too! This week’s hot spot was the master closet, and even though I had a crazy and busy week, I was able to finish up my project yesterday, and I’m pretty happy with the results. We live in an older house, and our closets are tiny, so that has been a challenge for us since we have lived here. I had already majorly purged my clothing from what I used to have when we lived at our house. But, I knew there was still room for improvement because there were still items hanging in my closet that I’m pretty sure I haven’t worn since we moved here almost two years ago. I’ll also say that I really haven’t shopped much since we moved here. In trying to live frugally and save money, one of the ways that I’ve cut back is by not really purchasing much for myself. I can count on one hand the items that I have bought new for myself at a regular store, and probably on two hands the items that I have purchased used from thrift stores in the past two years. So, while there was room for improvement, I didn’t think I had a lot of stuff to get rid of. I woke up on Monday morning, excited to get started on this project, so I opened my closet door and took the “before”pictures. In my defense I will say that over the weekend I was working on laundry in our room and my kids were playing with our shoes, so that’s why they were all out, but I also, obviously, hadn’t taken the time to put them back yet. Oops. I didn’t have all of my clothes in one place because I am running a little behind on laundry right now. But I figured that if a clothing item was in the dirty laundry, that meant I had at least worn it lately and would probably keep it. You also can’t really tell in this picture, but my clothes are already organized by color and style, so I didn’t really have to redo that. I just had to weed out what I don’t wear, and what didn’t really fit anymore. So, I started on Wednesday and made my first pass at sorting and purging the clothes in my closet. I only got to work for about an hour, but got a pretty good pile of stuff to go in my giveaway/garage sale pile. I finished up the project yesterday by going through clothes that had been in the laundry, my drawers, and shoes, and actually cleaning the closet. Above is my giveaway pile and bag of stuff I’m just throwing away. I am keeping a few things to maybe use for craft projects (except we all know how crafty I’m not), and I’m giving myself the limit of one year. If I haven’t used the item for a craft by this time next year, then it’s gonna go. So are you ready for the the big reveal? I realize it’s really not that big of a transformation, but because it’s such a small space, it’s kind of hard for it to be. I feel much better about the clothes that I kept now though. I even found a few things that I had forgotten about wearing, but really like and want to wear more often, and I know what I need to add to help round out my wardrobe. Our family continues to be on our journey toward changing our relationship with our stuff, and cleaning out and organizing my closet has helped to simplify my wardrobe, and will help me to wear and appreciate the clothes I already have, instead of always feeling like I have nothing to wear, even though I have a closet full of clothes. *And just a side note: the clothes on the left hand side of the closet are my hubs, and I didn’t touch any of them. I mean, the man does have more clothes and shoes than I do (he has more in the guest room closet). Do you think now that I’ve done this, I can get him on board to do it too? 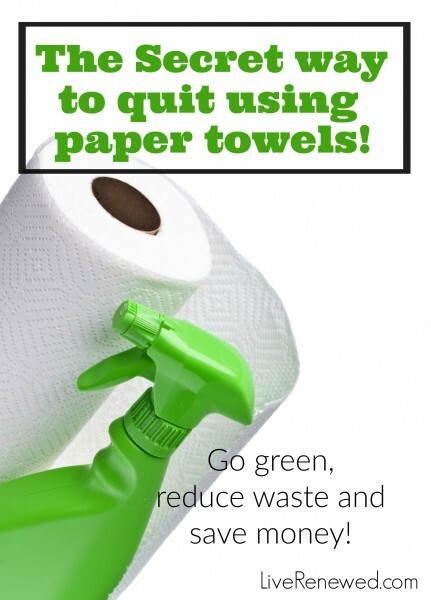 We’re talking all about Green Spring Cleaning here at Live Renewed this month! I’d be honored if you’d join us, be sure to subscribe to receive posts in your inbox or reader. You can also connect with me on Twitter and Facebook! Head over to Simple Mom to see more before and after master closet makeovers! Before and After: Master Bedroom How To Keep A Clean Home: Daily Chores How I Quit Using Paper Towels, and You Can Too! March Change Challenge – Too Much Stuff! That is a fantastic REAL transformation… I like that everything is in its place and its seems FUNCTIONAL! Way to go! i actually organized our master closet a few weekends ago so i didn’t participate in this project, but i’m hoping to join in on the others. I have what I’m calling an Insane List of Goals for this year. On that list is the task of organizing my master bedroom. I’ve pretty much accomplished that except for the closet. Hopefully, this post will be the kick in the pants that I need to get that done so I can cross it off my list! I also tackled my closet recently. When it’s done you just want to stand there and look at it – such a good feeling. One thing I did that you might want to consider. I was brutally honest with myself and our human faults. I looked at my neatly stacked sweaters and asked myself how long they would stay that way pulling from the bottom of the stack or being a little short of arm length to get that sweater squarely on top of the stack without it falling over. I found some cheap baskets the approximate size of the sweater stack and put the stack in it. I also found a package of cheap flour sack dish towels to use as a dust cover. (I just tuck the excess down the sides of the stack.) Those days when I’m in a rush, I can pull down the basket, set it on the bed, pull out the one I need and plunk the stack back in the basket. I may not have time to put it back in the closet right then, but it’s so easy to do I always put it away later. The baskets allow air circulation too. One of my baskets holds my purses too. I’m a weirdo who loves to organize, so I go through the closets in the house a couple times a year and organize and purge. I did my side of the master not too long ago, needed to organize all my exercise clothing since it’s grown so much within the last year. It’s always refreshing to go back into the closet once it’s organized and has less “stuff”. LIke you, I don’t touch my Husbands stuff. He needs to deal with that. haha!